Love is in the air and so is the smell of chocolate! Ahhhh chocolate, oh how I love thee, let me count the ways or better yet count all the chocolate cookies I pop in my mouth. I guess you can tell, but today I have a super, duper chocolaty cookie that is so perfect for chocolate lovers and brownie lovers. 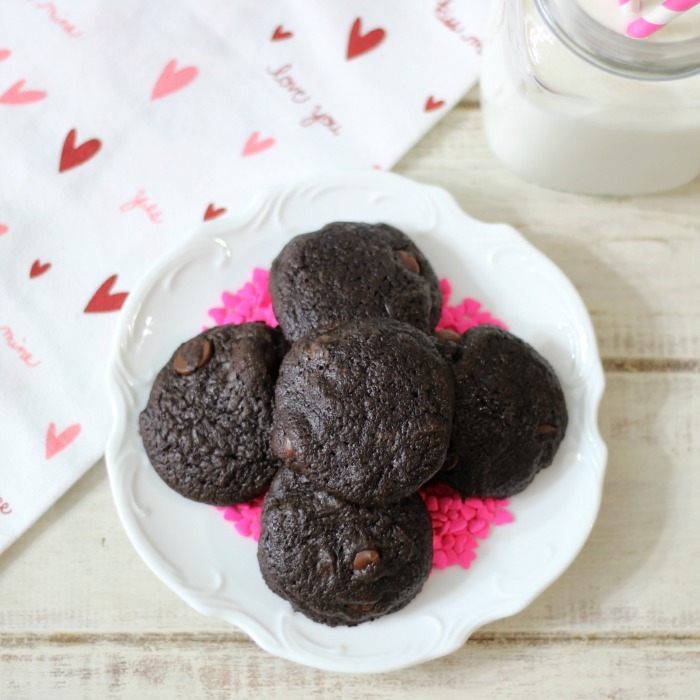 These little Chocolate Brownie Cookies are like little bites of brownies, but shaped like a cookie. You must be warned! 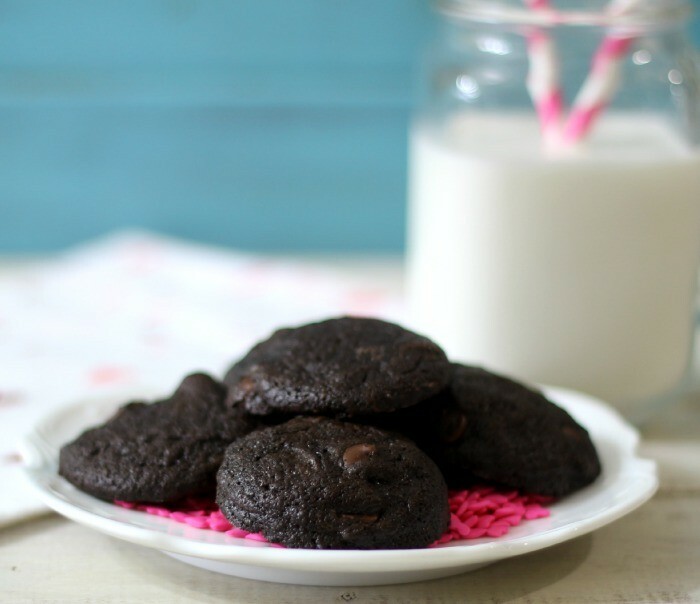 These cookies have so much chocolate in it, that you need a big glass of milk to accompany it. trust me on this one! 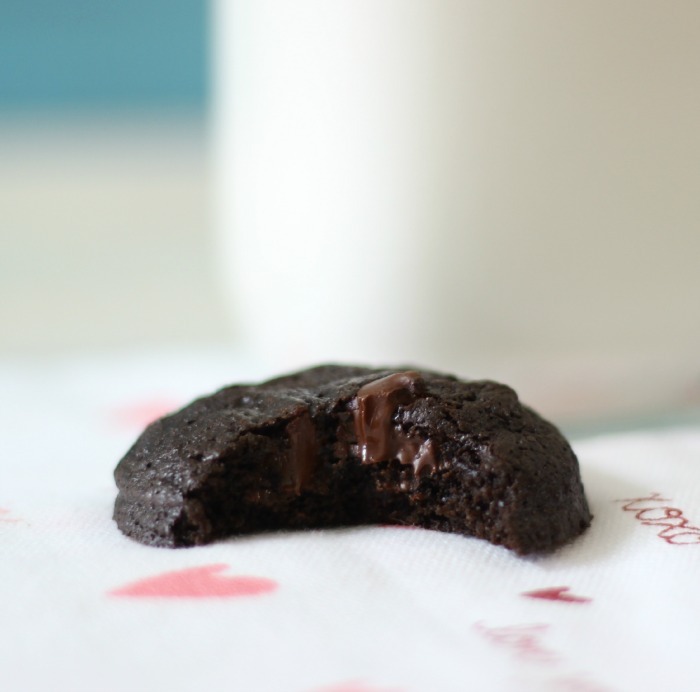 The cookies have firm edges and soft brownie like center. I made these cookies with Trader Joe’s Dark Chocolate Pounder Bar and Nestle’s Dark Chocolate Chips. Yummers! To make the recipe, I melted a half cup of chocolate with butter in the microwave. Than I added the melted chocolate to the mixture of flour, cocoa powder, eggs and sugar. Mix it all together and drop onto a baking sheet. If the batter seems to soft, just let it rest for a few minutes. It will firm up. I found this out when I was making the second batch. 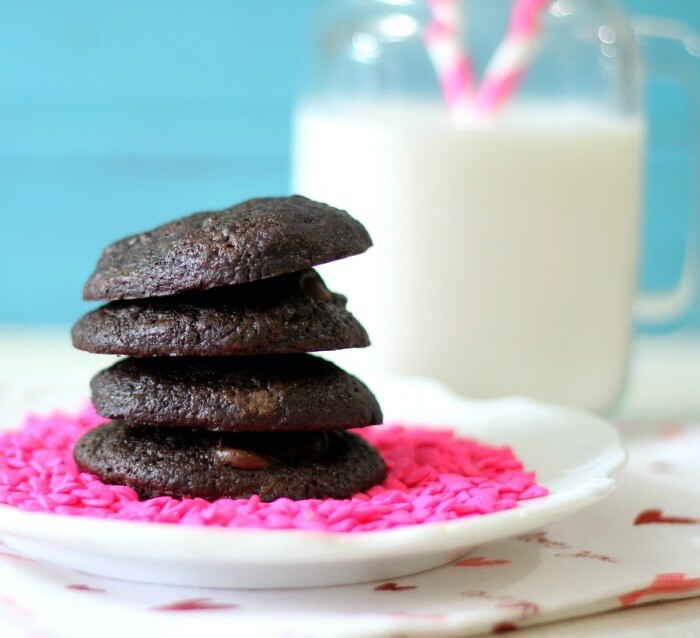 A super moist, sweet chocolaty cookie made with dark chocolate and has the texture of a cookie but the taste of a brownie. Preheat the oven to 325 degrees. Line the sheet pans with aluminum foil; set aside. Melt ½ cup of the dark chocolate with the butter in the microwave in 20 second intervals, mixing in between each interval until melted. Let the chocolate cool to room temperature. To make the batter, combine the flour, cocoa, baking powder and salt in a small bowl, set aside. In a large bowl, beat the eggs and sugar until thick and light yellow, about 2 minutes. Stir in flour mixture and cooled chocolate and beat for 1 minute. Fold in the remaining chocolate chips. Drop tablespoons of batter onto the prepared cookie sheet pans about 2 inches apart. Bake for approximately 10 minutes, or until just firm. Remove from the oven, let cool for 5 minutes; transfer to a wire rack to cool completely. I used 4 oz of Trader Joe's dark chocolate bar for the melted chocolate and than at the end of the recipe I used 1 cup of Nestles dark chocolate chips. Ohhh yeah! 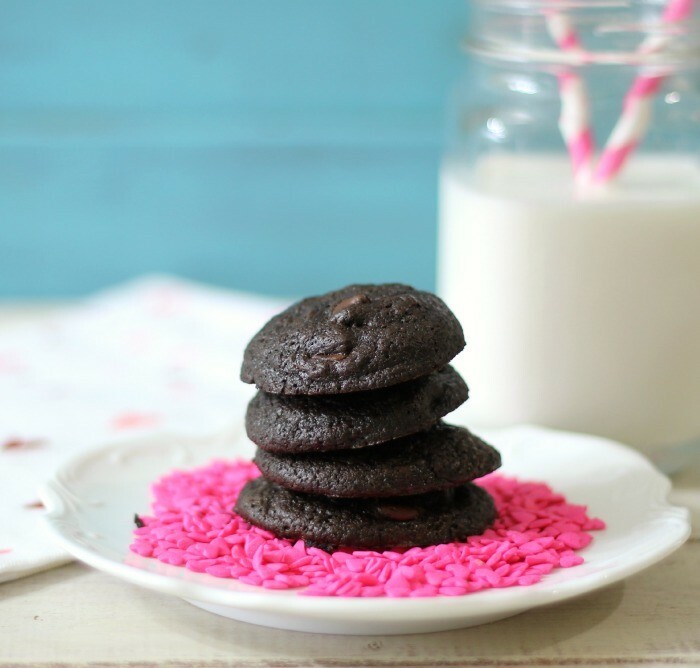 If you’re looking for a cookie to give at Valentine’s Day, this is one to make. I think it would be fabulous served with a small dollop of cherry, raspberry or strawberry ice cream. Well my friends, that’s it for me. I am off to make something yummy for dinner.